A healthier take on popular burrito bowls using a super easy to make veggie base! Most burrito bowls don’t have a lot of vegetables since the base is typically a generous serving of rice and beans. 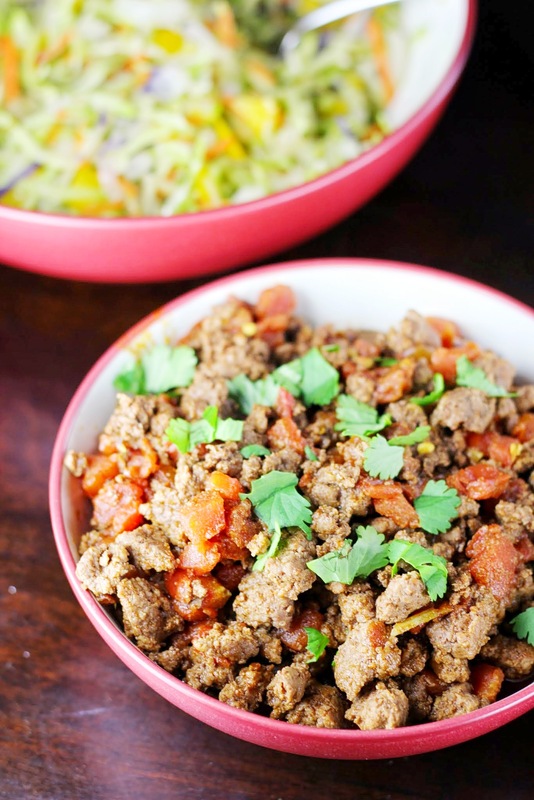 To make these burrito bowls paleo/whole30 approved, I swapped them out! And, I took a shortcut, which I don’t often do in the kitchen. This simple swap makes this meal super convenient and easy, perfect for a weeknight meal. The end result is 110% delicious and you won’t even miss your former rice and bean base. Plus, it’s so so so fast and easy since all you have to do is open the bag and start cooking! Why have I not thought of this sooner?! I have a feeling I may be using this shortcut for other meal ideas, too. 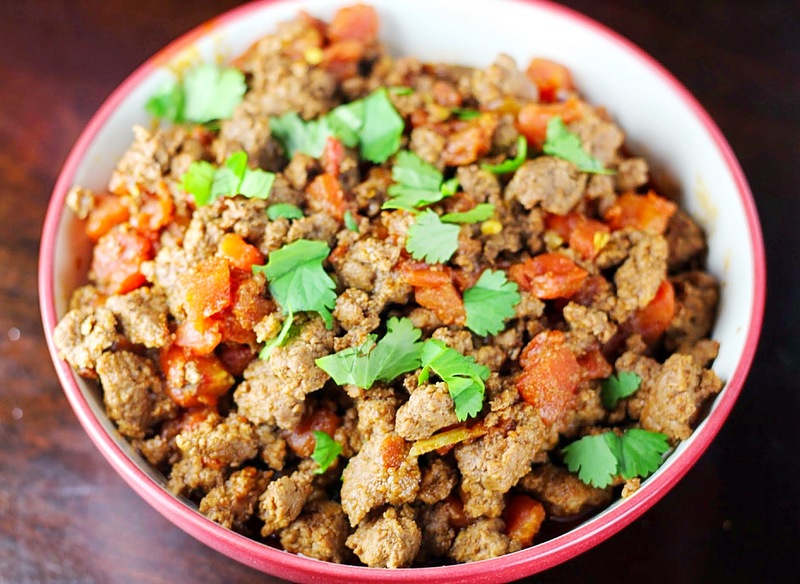 The meat is really flavorful thanks to spices, a can of diced green chiles, and fresh cilantro. 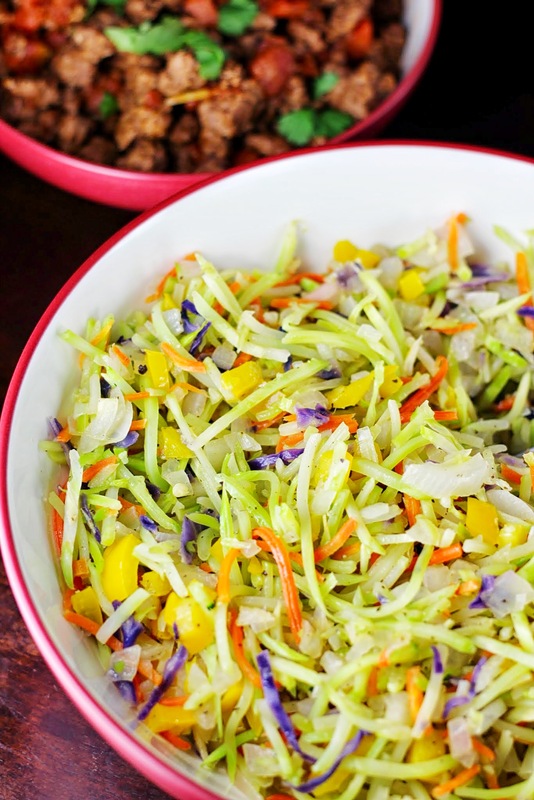 Spoon it over your veggie base and then add whatever toppings you’d like! My favorites? Salsa and guacamole. Yum! One last thing–my husband put the slaw and meat in tortillas to eat as tacos instead of as a bowl, and he was a huge fan. So, that’s another option for you or your family members! 1). Pre-heat oil in a large skillet over medium heat. 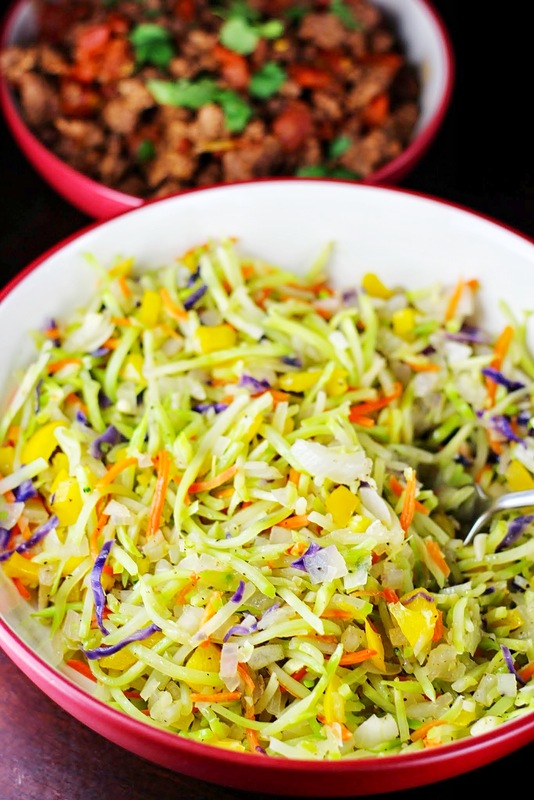 Add the broccoli slaw, onions, bell pepper, and garlic. Add salt and pepper, to taste. Sautee for 5-8 minutes or until crisp-tender. Remove from the pan and set aside. 2). Brown the ground beef in the skillet. Add diced tomatoes, green chiles, and spices. Stir to combine, adding a little water (I used about 1/3 cup) if necessary. Cook until most of the water has evaporated. 3). To assemble: layer the bowls with the sauteed vegetables on the bottom, then the meat sauce and toppings of choice. Enjoy! Servings: 4. Approximate Nutritional Information per Serving: Calories: 301 Carbs: 17g Fat: 15g Protein: 25g Fiber: 4g Sugar: 8g Points+: 8 Recipe adapted from here.